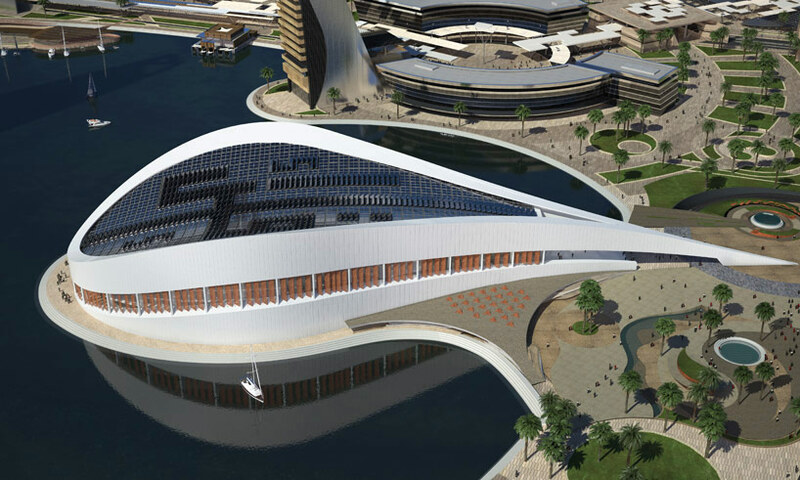 architecture in iraq surveys the contemporary condition of the country’s built environment, showcasing a range of innovative projects and the diverse materials and unconventional forms employed in their construction. 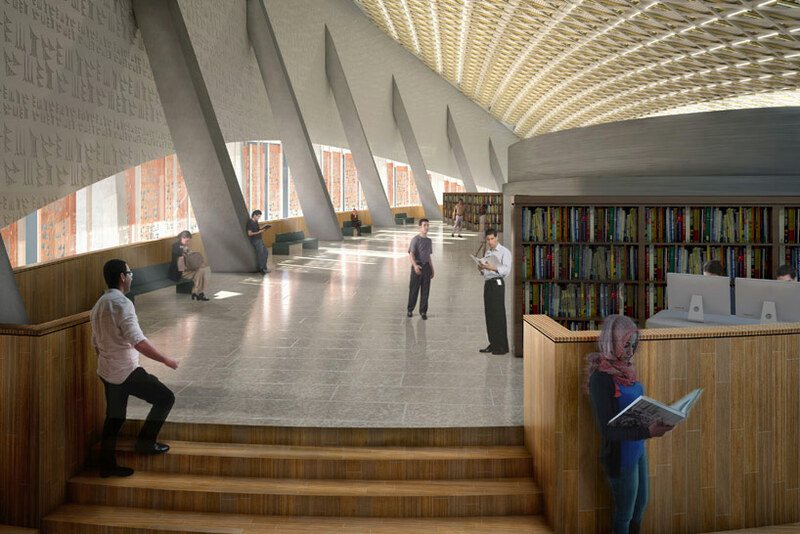 british-iraqi firm AMBS architects has just shared with us their design for the new baghdad library- the first public library to be constructed in the city since the 1970s. 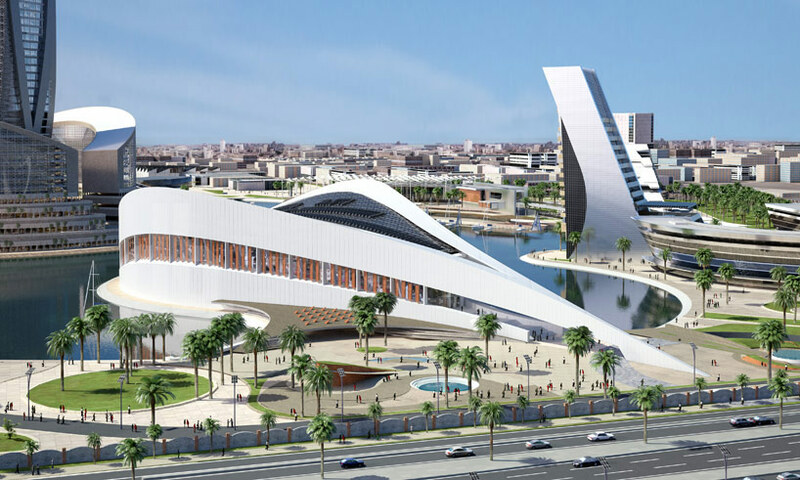 informed by the sinuous shape of the drop-like peninsula and the arabic kufic word for ‘read’, the building will project out over a lake at the heart of the 1,200,000 square meter youth city masterplan. 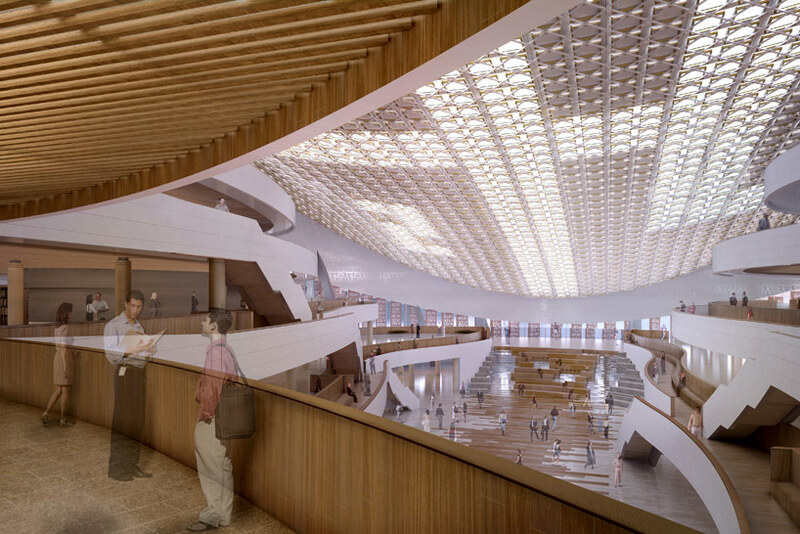 the revitalizing structure will boast the largest reading room in the world, in part due to a steel cable mesh building system that will allow a 80 meter across, single-span volume. 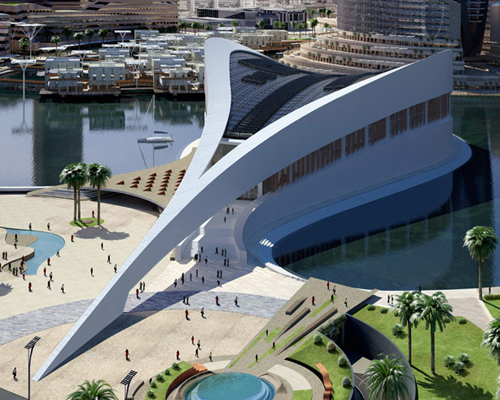 the central architectural gesture is a double curved roof designed specifically to allow ample natural light to pervade the space through a network of skylights. the sweeping architectonic language remains a constant throughout the interiors, what with a cascading terrace and directional valley that creates pockets of smaller reading areas and event spaces. 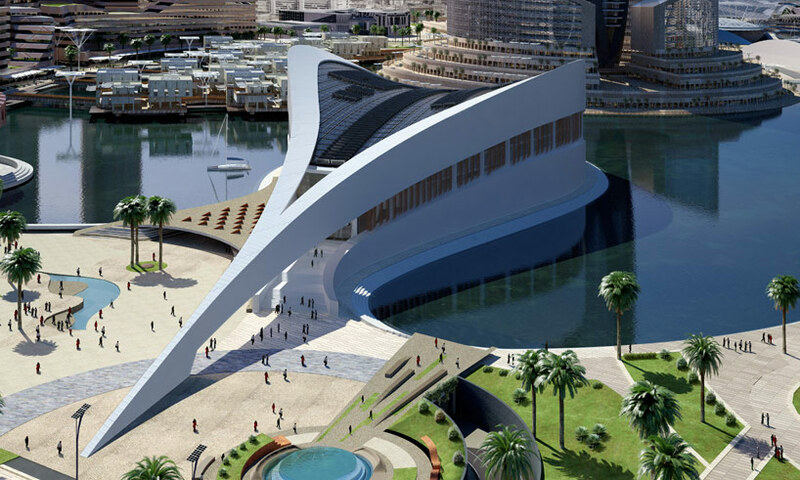 AMBS will use the opportunity of the monumental project to implement sustainable systems in the region, namely rooftop solar panels and a streamlined form optimized for passive cooling. 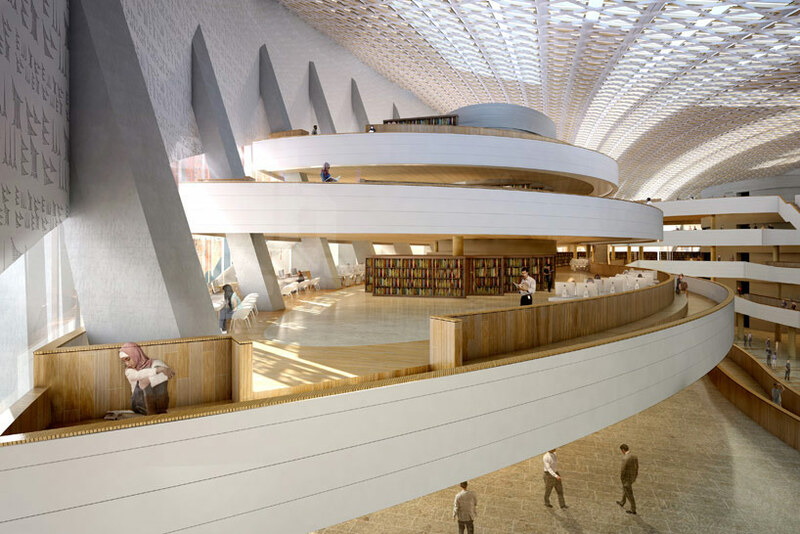 while the library is but one of the 30 new buildings envisioned in the masterplan, the progression of so elegant a project shows a greater commitment to building an iraq that remains a cultural center, accessible place of knowledge and a beacon of centuries-long erudition. This is outstanding, so happy to finally see something positive coming out of Iraq beings seen by the world. Thank you for sharing such beautiful news, made my year! I fully agree with the previous poster! it is nice concept and form ,but……………..im wondering where the sight is coming from?????? ?is it Baghdad?????? !!!!!!!!!!!!! !we all know that a reality is one of the most important role for the successful project design…………. Though Baghdad might be struggling now, slowly but sure it could reconquer its glory back. We hope to see a beautiful Baghdad again.